The past few years have been a bit of an undocumented period for me. I used to write pretty prolifically on the personal level and now it’s dwindled to not even a trickle, except for the odd journalling jaunt. Recovering the process will probably take some time, but in the meanwhile, I’m going to post bits of the trail from along the way. Here’s a paper I did back in 2007 — barely six months out of Auroville — on a subject that’s near and dear to me, and details some of the inspiration behind my fascination with ecology and the collectivity of human consciousness. V. That is the state of deep sleep wherein one asleep neither desires any object nor sees any dream. The third quarter is Prajna, whose sphere is deep sleep, in whom all experiences become unified, who is, verily, a mass of consciousness, who is full of bliss and experiences bliss and who is the door leading to the knowledge of dreaming and waking. Humans spend approximately one third of lives asleep – and dreaming. From ancient peoples to modern-day, technological societies, dreams have always been accorded a unique place of mystery in the collective histories of the human species. Since earliest times, dreams were seen as communicative catalysts, as creative, naturally connective forces offering access to other worlds perceived to be as real as this reality. The infinite vast of the mass unconscious was a state to be explored through dreams in order to achieve an understanding of the immanent and archetypical workings of both natural and supernatural worlds. Yet, despite drawing from diverse religious and cultural perspectives on dreaming, modern society still understands relatively little beyond today’s modern scientific and individualistic, clinical approach to dreams. Understandably, modernity’s over-emphasis on the individual, the quantifiable and the material has resulted in a deficient understanding of dreaming and of the unconscious self – a bald ignorance plainly and painfully manifested in our current alienation from nature and our reckless destruction of life and of our own selves. To paraphrase Schweitzer, the true task lies in turning inwardly to develop a universal ethic rooted in the fact that our consciousness is fundamentally a “will to live,” from which a universal ethic of “reverence-for-life” springs when sympathetically expanded to include all aspects of life-as-consciousness (Reverence For Life 126). Since the current scientific understanding of consciousness is speculative at best, it would not be too farfetched to venture that life also embraces the unconscious as the source of this ethic as well, for to preserve the ecology of our inner world is also to uphold nature’s last, vast wilderness. In this wilderness of the unconscious, dreams offer a kind of self-transcendence and are the constantly transforming, creative expressions of an individual scale. Mythology, on the other hand, emerges from dreams on the collective scale, or from what Jung termed the collective unconscious. Mythology is the creation of a collective dream consciousness that constantly engages and embraces all across socio-spatial bodies and across evolutionary time, arising from the human need to organize and seek meaning from our environment. As these are times of persistent de-symbolization and de-sacralization, humankind is understandably searching for a collective mythology of meaning to make sense of it all. After all, one of the greatest pretenses achieved by modern history is the repudiation of collective dreams for the pre-packaged spectacle of the American Dream. But by turning inward – and understanding the relationship between self within the collective ecology of the unconscious – can the universal birthright of dreaming be reclaimed as the ultimate creative force. To recognize the fundamental influence of dreaming to the evolution of human consciousness is to build a new universal ethic of being, meaning and of relationship to the larger world and environment. It is to essentially liberate an ethic founded on affirming life’s interdependence and aspire for a collective, co-creative dreaming to honour life in all its unknowable multiplicity. 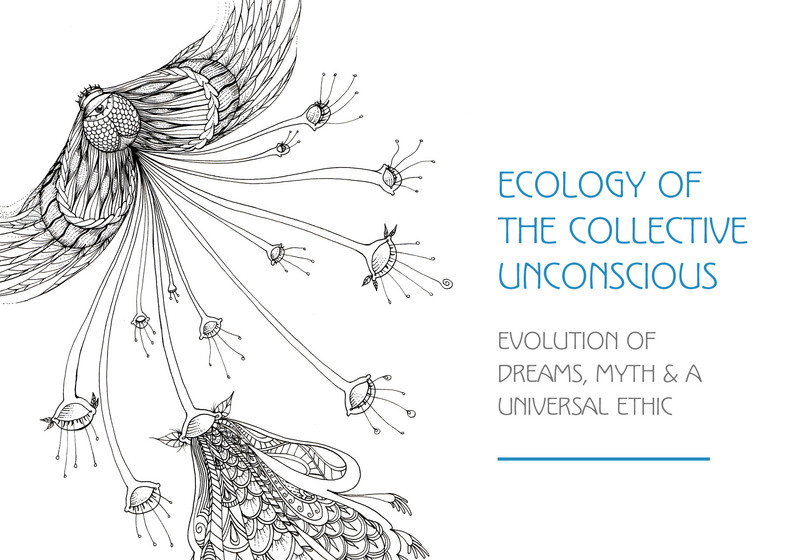 Though modern humanity has yet to even fully apprehend the interconnectedness of waking consciousness, the critical task here is to recognize the collective unconscious as a kind of living ecology as well. To practical, well-meaning people this idea may seem superfluous and unproductive; however, it is worthy to note that this connective awareness was already taken as a concrete (not just spiritual) fact of life for preliterate peoples such as the aboriginals of Australia, and for many other ancient civilizations as well. With such a historical grounding, such a recognition can only serve to enrich our understanding of ecology. In the modern context, one can synthesize an intellectual (if incomplete) approximation by drawing on ideas from Carl G. Jung, memetic theory, ecological and social autopoeisis, along with other ideas of evolutionary consciousness to arrive at a deeper ethic. Additionally, one can also examine the groundwork laid by neuroscience and emerging practices such as eco-psychology to better understand what potential role dreams and the collective unconscious may have on connecting the dots of shared evolutionary destiny between all living things and to chart an atlas for action and service, guided by a reverence-for-life.